The other evening we visited a nearby garden and I took some shots in strong winds. That’s why these pictures are slightly out of focus and won’t be in my Flickr photostream. They’re considered inferior, but I like them. Hope you do too. These are called “flame azaleas”–appropriate, non? I don’t know the name of this azalea, but think it’s sweet. Have never seen a white with pink edges before. There must be so many varieties of azaleas. Another shot of the “flames.” The greens in this area just kill me. They tend to be more yellowish in California, I think. The East Coast has more bluish greens, like England. I can’t wait to scan my negs of the trip to the Cotswolds and London. I may go back and reshoot this. I think I cut off too much of the trees at the top and at the left. The light was so lovely the other night…. Well, I’ve just changed my mind and decided to put this photo on Flickr after all. If I reshoot, I’ll switch it out. 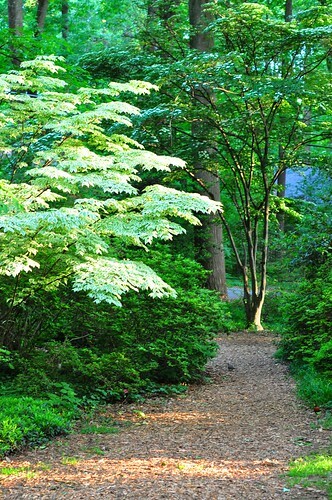 This entry was posted in gardening, photography and tagged azaleas, orange flowers, path, pink & white flowers, trees. Bookmark the permalink.